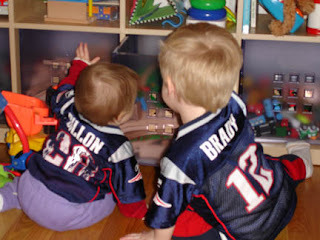 Here's my little Patriots kids. Baby Corey Dillon and Preschool Tom Brady. For some reason all the lettering in the Dillon onesey came off over the last 4 months since I bought it. But she had nearly outgrown it. I'm sure it would have made it one more game, but now we can safely put it in the "Outgrown" pile. We're done with the jerseys until the fall. I'm flabbergasted that I'm even remotely upset about this.